Texas Health Institute is a 501c3, which provides leadership in development of health care solutions to shape the Texas health care landscape. As an independent, nonpartisan, nonprofit organization, THI takes a broad view of health care issues and their impact on people and their communities. From acting as a neutral convener and facilitating balanced health care dialogue, to creating a vision of improved health care, THI is a think tank - providing innovative, "outside the box" collaboratively developed options to improve the health of people and their communities. For additional information, please visit www.texashealthinstitute.org. 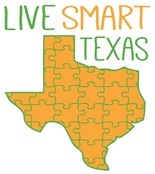 Live Smart Texas (LST) is a coalition of Texas organizations focused on addressing the state’s obesity epidemic, especially in children, through collaboration. A convergence of social, political, economic, and programmatic interests led to the formation of the coalition in 2007. Today 120 unique organizations across the state of Texas are coalition members. Our members represent all key sectors including policy, educational institutions, state organizations, research centers, professional associations, and local community groups. Live Smart Texas members share the belief that collaborations can achieve better outcomes than individual entities working on their own. For additional information, click here.